Home News & Analysis Africa Regardless Presidential Election Re-run Outcome, Will Investors Continue to Fret Over Kenya? Regardless Presidential Election Re-run Outcome, Will Investors Continue to Fret Over Kenya? The Nairobi Securities Exchange All Share Index is up 28% in YTD 2017 according to total returns and the MSCI country index is also up by the same percentage. Telecom services has led the index as the sole holding – Safaricom – has zoomed this year. It is the single largest component of the index, and its contribution to the index’s rise is larger than all stocks from the financials sector – the second highest contributor – put together. Meanwhile, KCB Group and Equity Group Holdings have led financials. Utilities is a distant third. The table above lists some key metrics of the All Share Index which indicates that Kenyan stocks remain an attractive proposition in terms of valuations and liquidity. Even though the current ratio is lower than it was five years ago, it is not worrisome. Bond markets also reinforce Kenya’s attractiveness. The graph above plots the yield on the 10-year government bond. The yield has continued to decline, reflecting its high demand among investors, apart from improved economic prospects. Further, it has absorbed the impact of the annulment of the August elections quite well. For prospective investors, the yield still remains at a high enough level to be attractive, even among the broader emerging and frontier markets universe. 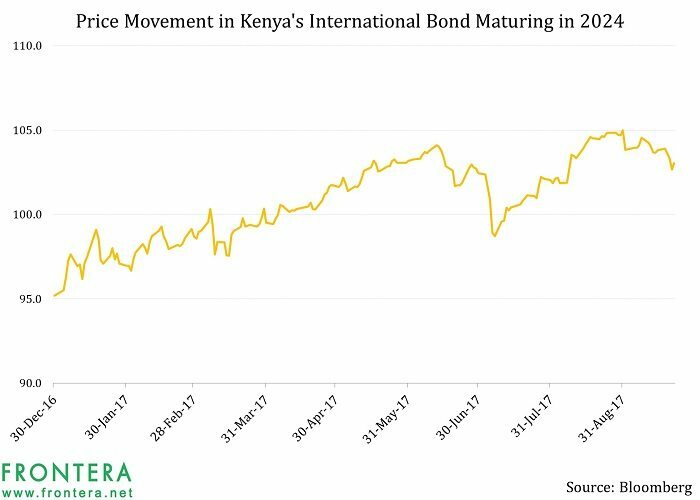 The 10-year international bond issued by Kenya has also absorbed the impact similarly well, as shown by the graph below. The bond, which has a coupon of 6.875%, is yielding 6.61% at present. Drawing on historical precedent, it is the occurrence of violence which can be one of the biggest red flags for international investors. And there’s a possibility that it may transpire regardless of the victor in the October 26 elections. Given that the Supreme Court observed illegalities and irregularities in the election process, there are questions surrounding the integrity of the coming elections, and President Uhuru Kenyatta’s chief opponent Raila Odinga has already expressed this concern. On the other hand, though Kenyatta respects the court’s decision, he does not agree with it and has vowed to fix the problem in the Judiciary once he returns to power – a strong statement against the judicial setup. People from both camps have engaged in violence since the results of the August elections were announced. At this juncture, violence breaking out after the October result, regardless of the victor, remains a very real possibility given the animosity between the two major competing alliances. 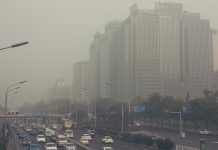 If this occurs, it could potentially drain foreign investments from local financial markets as a positive macroeconomic picture will be severely eroded by any major altercation. There are other countries in East Africa, and from the rest of the continent, apart from the broader frontier market universe, which could potentially provide appreciable returns to overseas investors without a substantial worry of violence that could throw the country off the economic growth path. Though the Supreme Court has successfully reinstated faith in the judiciary and brought back investors for now, the possibility of violence, and the eventual winner of the upcoming re-run of the election will set the tone for financial market performance in Kenya in the medium term. 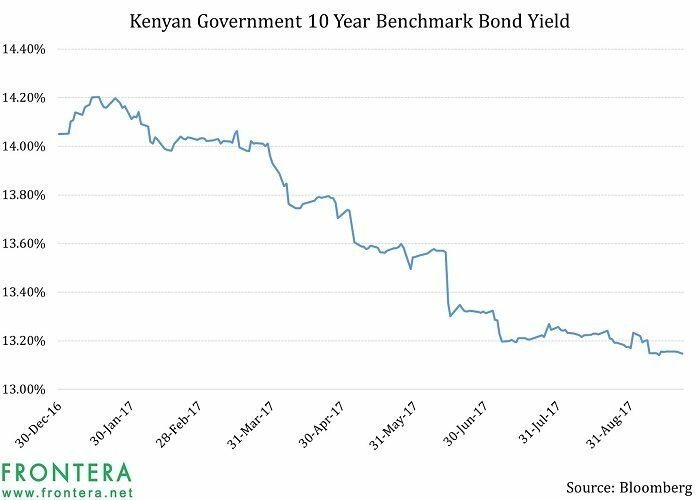 Previous articleBacked By Judicial Hope, Will Kenya’s Stock and Bond Markets Continue Their Rebound?